Construction has begun in China on the third new Stena Line ship to be deployed on Irish Sea routes. 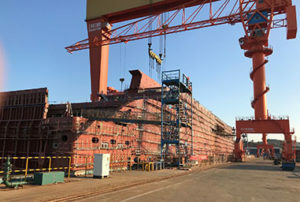 The steel cutting phase has begun on the third E-Flexer RoPax ship at the Avic Weihai Shipyard in China, with the vessels due to enter service in 2020 and 2021. Construction is halfway through on the first E-Flexer vessel which is planned to start service the Dublin-Holyhead route in early 2020, with four daily sailings and an estimated crossing time of 3.5 hours. Ian Davies, Stena Line Trade Director Irish Sea South, said: “Construction is going to plan on our new generation E-Flexer vessel which is set to increase our freight capacity significantly on the Dublin to Holyhead route and raise the service standards for our travel and freight customers. The Belfast to Liverpool ships are due to enter service in 2020 and early 2021. All three Irish Sea E-Flexer vessels will be bigger than today’s standard RoPax vessels at 215m long with a freight capacity of 3,100 lane metres and the space to carry 120 cars and 1,000 passengers.